Command Sgt. Maj. Jessie C. Harris Jr.
NCOs, the backbone of the Army for more than 240 years, are having to step up the game in the multinational, multifaceted environment of modern Europe. In addition to their core responsibilities of training, preparing and leading soldiers, NCOs need to be innovative thinkers, creative leaders, skilled diplomats, and jugglers able to balance competing requirements. There is no doubt they can do it. From the cold winters of Valley Forge, Pa., to the beaches of Normandy, France; and from the fields of Vietnam to the deserts of Iraq and Afghan-istan, NCOs have trained and prepared soldiers to fight, win and survive in some of the most difficult and unique combat situations imaginable. The role of the NCO has continually evolved. Today, nowhere is that evolution more clearly seen than in their support of America’s NATO allies in Europe who face new, complex threats ranging from a resurgent Russia to asymmetrical conflicts to terrorism. For NCOs accustomed to fulfilling a variety of roles, European assignments now routinely include responsibilities for validating equipment interoperability and strengthening readiness among the militaries of alliance members as well as developing junior leaders. These endeavors require our NCOs in U.S. Army Europe to hone a fair degree of diplomatic skills along the way. Sgt. Robert Snyder of the 2nd Cavalry Regiment directs Pfc. Bing Stewart during an exercise in Lithuania. Against that backdrop, today’s NCOs in Europe must be more agile, innovative, balanced and creative than ever, particularly at a time when external pressure to reduce the size of the Army remains quite heavy. As Lt. Gen. Ben Hodges, commanding general of U.S. Army Europe (Seventh Army), has said, we must make 30,000 soldiers continue to look and feel like 300,000 soldiers. NCOs in Europe, who are advising senior defense officials and briefing U.S. and foreign dignitaries while simultaneously fulfilling their primary role as trainers, play a vital role in that mission. Interoperability is basically defined as systems, units or forces providing services to and accepting services from other systems, units or forces, and using those exchanged services to enable effective operations. In the European theater, these types of exchanges happen on a daily basis under the watchful eyes of our Army NCOs. For example, our logisticians conduct exchanges of palletized load system flatracks with Lithuanian and British forces. Also, ongoing compatibility tests of heavy equipment transporters continue to be a highlight of armored vehicle movements in the multinational environment. Last fall’s Exercise Trident Juncture, the largest NATO and partner exercise in a decade, showed the multinational flavor of operations. The U.S. Army’s 515th Transportation Company, U.S. Army Europe’s only bulk fuel company, used NATO adapters on bulk petroleum equipment to smooth the way for the successful transfer of petroleum products from U.S. to Polish, French, German, Spanish and British forces. The enhanced interoperability among those six nations helped reduce the NATO “tooth-to-tail” ratio in that exercise. There is simply no reason for a multinational force to utilize its own fuel systems when one or two nations can take the lead on fuel operations for all participating nations. The contributions of Army NCOs during exercises Combined Resolve, Swift Response and Saber Strike, for example, are invaluable to the linkage of progressive and sequential training needed to continue building interoperability. Sgt. 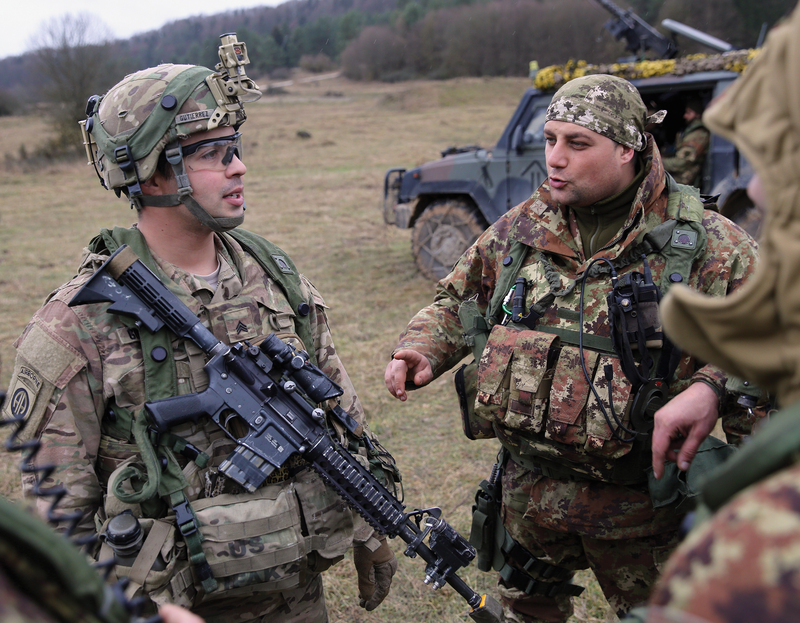 Michael Gutierrez, left, with the 173rd Airborne Brigade, talks with Italian soldiers during training at the Joint Multinational Readiness Center, Hohenfels, Germany. Fostering interoperability in training is another key mission for Army NCOs in Europe. At the squad level, they oversee multinational training on a daily basis. Training interoperability prepares our forces to operate seamlessly as we move, communicate, support and sustain U.S., NATO and partner-nation forces no matter where they deploy in the operating environment. This principle is clearly reflected in Operation Atlantic Resolve, the ongoing series of multinational training activities taking place in Latvia, Estonia, Lithuania, Romania, Poland, Hungary and Bulgaria. In this and other training initiatives, our Army NCOs are gaining valuable knowledge while integrating training concepts, developing experience, identifying training gaps and leveraging technology to build and strengthen the alliance. During Exercise Trident Juncture, movement-control specialists from the 16th Sustainment Brigade served at multiple nodes. Army staff sergeants not only oversaw seaport debarkation/embarkation operations and airfield departure/arrival control group operations, but also trained U.S. forces and movement specialists from Denmark, Germany, Poland and Great Britain, all supporting the onward movement of cargo and equipment to the multinational force. NCOs also serve as observer/controller trainers in exercises conducted at the Joint Multinational Readiness Center and Grafenwoehr Training Area in Germany, where interoperability training takes place at the brigade level and below using live, virtual, constructive and gaming initiatives. This training at the small-unit level enhances the interoperability and sustainment of our maneuver and fires elements, which increases lethality. As U.S., NATO and partner-nation forces continue to train together, increase readiness, and strengthen the alliance for unified land operations, they build the flexibility, lethality, adaptability and depth required for successful operations in any environment. The development of junior leaders by NCOs in U.S. Army Europe is the cornerstone of our success in the multinational environment. Junior leaders conduct convoy operations over several thousand miles while crossing multiple nations’ borders to deliver equipment and supplies to our U.S., NATO and partner-nation forces. Sergeants and staff sergeants advise members of the National Movement Control Centers and embassies in Estonia, Latvia, Lithuania and Poland, serving not only as NCOs but as ambassadors for the United States. This level of decentralized leadership is necessary as senior leaders empower junior leaders at the lower echelons by providing capacity, authority and capability, and developing the responsibility to think autonomously. Junior leaders are entrusted to make ethical and moral decisions within the guidelines of the commander’s intent. 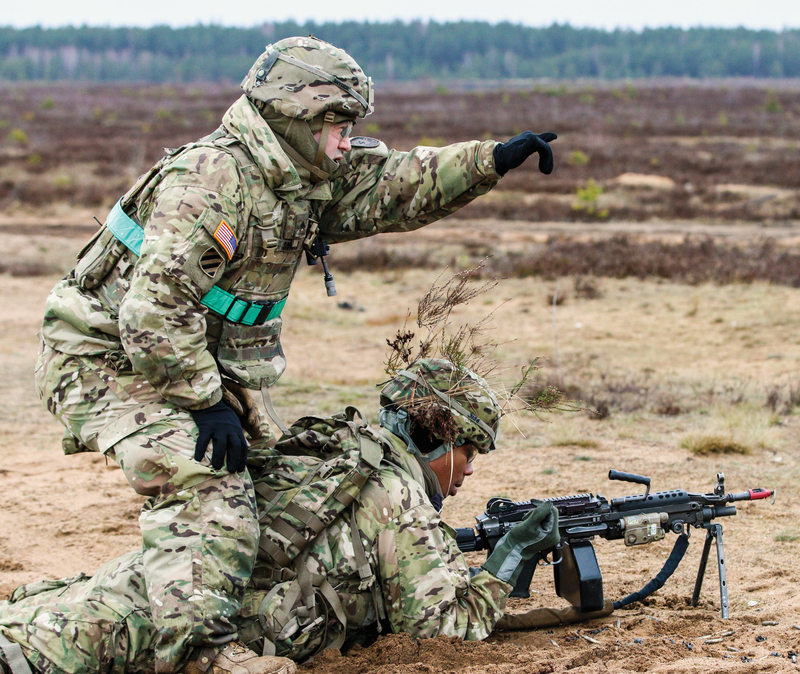 Junior leaders in U.S. Army Europe have the cognitive and interpersonal skills necessary to exercise the tenets of Mission Command in a complex tactical environment while making decisions with operational and strategic implications. Leader development continues at home stations as units and individuals compete at the U.S. Army Europe and Department of the Army levels, developing and building cohesive teams. Competition includes the Army Award for Maintenance Excellence, Supply Excellence Awards, Deployment Excellence Award and the Philip A. Connelly Awards, and membership in the prestigious Sergeant Morales Club. The result: Soldiers depart U.S. Army Europe with skills and traits unmatched anywhere else in the Army. In addition, NCOs train soldiers to inform the local national populace through radio, television, print media and public interaction. Training in basic language skills and culture awareness enables soldiers to successfully communicate and engage the local population. In turn, soldiers conduct interviews in all forums to inform the host nation at every level about how their organizations affect the local economy and the things they are doing with host-nation forces, and to provide reassurance that we are here to stand shoulder to shoulder with them. For example, during Operation Dragoon Ride last year, logisticians from the 16th Sustainment Brigade supported the 3rd Squadron, 2nd Calvary Regiment, during a 1,500-kilometer road march from Estonia to Vilseck, Germany. Soldiers conducted refueling operations, maintenance and recovery activities. The event allowed soldiers and leaders an opportunity to interact with the local public as the convoy traversed six different nations, building trust and improving governmental and nongovernmental support for the alliance. While the future operating environment is complex and uncertain, the Army’s NCOs must prepare soldiers as much as possible for the uncertainty of where and when the next conflict may arise. The NCOs of U.S. Army Europe are preparing soldiers to operate in a multinational environment through joint, multinational and combined arms training—rehearsing battle drills, standard operating procedures and mission orders to facilitate effective and efficient operations in the multinational environment. As NATO faces the challenges of tomorrow, leaders from all 28 NATO members and our partner nations must capitalize on every opportunity to train together and strengthen our relationships through personnel and equipment interoperability, development of junior leaders, building readiness, and training together in complex multinational environments. In that light, training soldiers is the most important duty of U.S. Army Europe NCOs. Fulfilling that duty is how we will ensure success in any future conflicts in Europe. Command Sgt. Maj. Jessie C. Harris Jr. is the senior enlisted adviser for U.S. Army Europe’s 39th Transportation Battalion (Movement Control), based in Kaiserslautern, Germany. He has deployed in support of numerous operations, including Desert Shield and Desert Storm, Joint Guard, Iraqi Freedom and Enduring Freedom. He holds a bachelor’s degree from Grantham University and a master’s from Excelsior College. He is also a graduate of all NCO Education System courses and the U.S. Army Sergeants Major Academy.